Ninjas! In this lesson we’ll be learning how to play Hysteria by Muse which was featured on the bands third studio album, Absolution. The track was released as a single on 1 December 2003 peaking at number 17 in the UK Singles Chart and also reached number 9 in the U.S. on the Billboard Modern Rock Tracks chart. Dominic Howard always comes up with the goods and the grooves he developed for Hysteria are the perfect example of this. For a three piece they make a massive noise so make sure you pull your weight when you play this song. A distorted bass line sets up the track and on bar five Dominic enters with a bombastic groove: eighth-notes peddled on the hi-hats, a bass drum, hi-tom and lo-tom on beat one then flammed backbeats on two and four. After four bars Dom lays into a heavy four-on-the-floor groove with eighth-notes played on the ride cymbal. The left hand (Dom’s right) plays all the off beats on an open hi-hat as well as the backbeats on two and four. The verse groove features off beat open hi-hats again, backbeats on two and four and a tricky 16th-note bass drum pattern. The big challenge here is co-ordinating the four limbs to make the groove sound and feel the way it should. This may require a bit of practice. On the chorus Dom plays eighth-notes on the ride cymbal, backbeats on two and four and a cool hi-hat punctuation on the a of two. The bass drum plays a relatively busy sixteenth-note pattern that fills in a lot of the gaps. The chorus groove could pose a bit of a challenge but the big sixteenth-note fill at the end of each verse may be the trickiest part of the tune. It is made up of two groups of six and a group of four so if you can perfect the individual groups first you should be able to put it all together. WANT TO PLAY LIKE A NINJA? 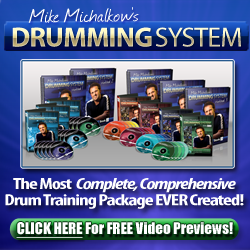 If you really want to improve your drum skills then check out Mike Michalcow’s Drumming System. This comprehensive training package covers everything you need to progress from complete beginner to seasoned professional. Just starting the drums? Check out the Rock Drumming System where you’ll discover how to play beginner-to-advanced beats, fills and more whether you read sheet music or not!